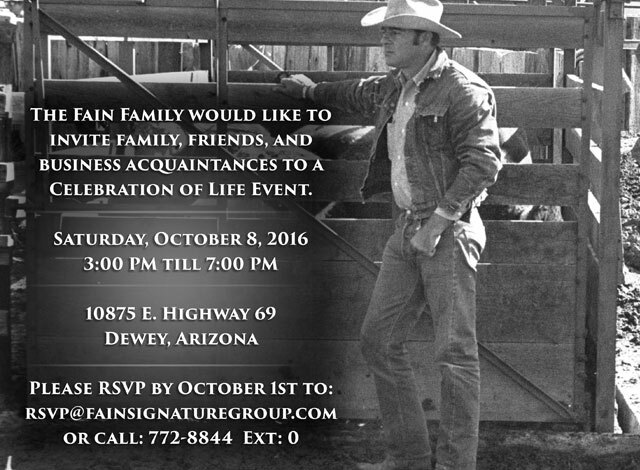 Love and respect for Arizona and the land had deep roots for Bill Fain. In 1874 his great-grandfather William Marion Fain settled in what is now the Verde Valley. His grandfather, Granville “Dan” Fain, was born on a Cornville cattle ranch in 1879. Bill’s father, Norman Fain, was born in 1907 on a ranch in Camp Verde. Norman Fain married his Prescott High sweetheart, Johnie Lee Parsons, and ten years later on January 20, 1938, Bill was born. By then, ranching was as natural to a Fain as breathing. Bill was riding horses on the ranch at the age of three and learned the cattle business from his dad, Norman, and his grandfather, Dan. Although only in his 20’s, Bill began to craft his strategy to create the Town of Prescott Valley. Fully realizing that a community needs jobs, industry, and affordable housing, Bill began with the fundamentals. And in Arizona, the first building block is water. In 1965, Bill organized the Shamrock Water Company, which 35 years later became the municipal water source for the Town of Prescott Valley. With a source of water secure, Bill entered into development agreements that led to a multitude of neighborhood divisions. Bill implemented the next piece of his community strategy by working with government and private partners to attract businesses to the region. Businesses meant jobs for the families of the growing town. By the mid-1990’s, the Town of Prescott Valley was taking shape and land donated by Bill would soon become the site of the new city hall, public library, and police station. However, Bill’s vision was not yet complete. Working with innovative partners in the community, Bill set out to build a central entertainment district and to bring a hospital to Prescott Valley. Bill may be gone from this earth but he has given a gift to us and to future generations. That gift is the realization of his life-long vision, to create a town where there was none and in the process he left us a wonderful place to live, raise a family, and retire. As Robert South said, “The truer measure of a man is by what he gives.’ Thank you, Bill, for giving us your dream. The Fain family has established the Bill Fain Memorial Scholarship Fund in his honor.